Powers Drives angels and demons out of vessels. Hyperbolic Pulse Generator. Exorcisms are unreliable. This device emits a force that drives the possessing demon from the vessel. The Hyperbolic Pulse Generator, also referred to as the Newton-Dee Hyperbolic Pulse Generator, is a device created by the British Men of Letters, used to expel demons from vessels. 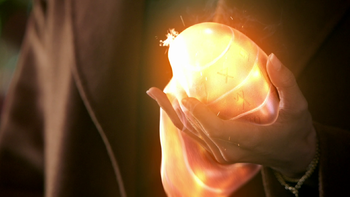 A combination of technology and magic, the egg-shaped device is adorned with various Runes of Honorius that will light up once an activation sigil is triggered with the blood of the user. The user will then recite the Latin "vade retro, princeps inferni", as a powerful pulse emanates from the device and forces the demon out of the body. Despite its initial intent for exorcising demons, the device is shown to be capable of exorcising even an archangel from its vessel. Lucifer is expelled from President Jefferson Rooney. After saving the Winchesters from the Secret Service, Mr. Ketch shows them his arsenal, including the Hyperbolic Pulse Generator. Recognizing its potential against Lucifer, Sam and Dean convince Ketch to give it to them. 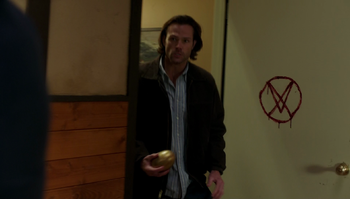 Luring Lucifer into a trap with the aid of Kelly Kline, the Winchesters get Lucifer alone in a motel room with Kelly. When she tells Lucifer that she can't have his child, he snaps and begins choking her. Sam then emerges from the bathroom with the pulse generator in hand. He actives a blood sigil on the door and recites the phrase "vada retro princeps inferni" causing a powerful pulse to beat Lucifer back. At the same time, Rowena begins the spell to send Lucifer back to his Cage. Lucifer, believing he is going to lose, tells Sam that it's not over, only to have Sam tell him to go to Hell. Lucifer is then expelled from President Jefferson Rooney, his essence swirling around the ceiling before disappearing down a heating vent next to Sam. 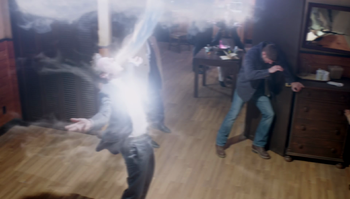 Later, Castiel takes the device and flees alongside Kelly. Michael destroys the Hyperbolic Pulse Generator. Sam reveals to Castiel that Ketch is in London searching for the "Newton-Dee Hyperbolic Pulse Generator", reminding Cas it was the device they used to eject Lucifer from the President. Sam explains that their hope is to use the device to exorcise Michael out of Dean, but Ketch has had no luck in finding it. Ketch is able to track down the generator in the possession of a Hungarian rare arms collector, Arpad Valko. 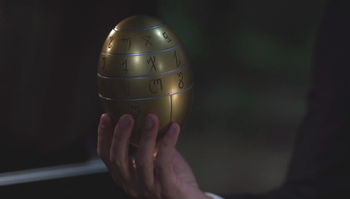 After easily breaking into the compound and retrieving it, he is attacked by mercenaries on his way to the airport and is forced to "drop" the "magic egg," sending it express mail to the Winchesters. Due to the holidays, the package gets stuck in Joplin, Missouri, forcing Sam and Jack to break in to the sorting facility to get it. When they are jumped and Jack is dragged away by Michael's monsters, Michael appears before Sam in his new vessel, holding the generator. As Sam attempts to attack him, he is flung into a truck and as he lays prone on the ground Michael melts the egg in the palm of his hand. Newton and Dee may be references to mathematician, astronomer, theologian, author, and physicist Sir Isaac Newton, and mathematician, astronomer, astrologer, and occult philosopher John Dee. The term "hyperbolic" comes from the the mathematics principal of hyperbola and it was Dee who "discovered" the Enochian language. This page was last edited on 7 March 2019, at 08:30.